This is a very modern, unique and new bridal Shower game that will test the intelligence of your guests. Your friends will have to guess all the bridal shower related words and phrases with the help of the emojis. I am sure that some of your guests will come up with some funny answers and that will make everyone giggle when you'll read those answers. Click here to download the printable answer key with all the correct answers for this quiz. How to Play: You should print these game cards in the color of your choice, one or two days before the bridal shower. The number of printed sheets of this game should be equal to the number of your bridal shower party's guests. Just distribute the sheets among the guests along with a pencil or pen. Set the timer to 3 minutes and ask them to write down all the bridal shower and wedding related words and phrases that they think these emojis are indicating. You can also play this game without the timer. Ask each gust to read the answer to each pictionary quiz. The person with most right answers will be the winner. Click here to download this game's	solution. 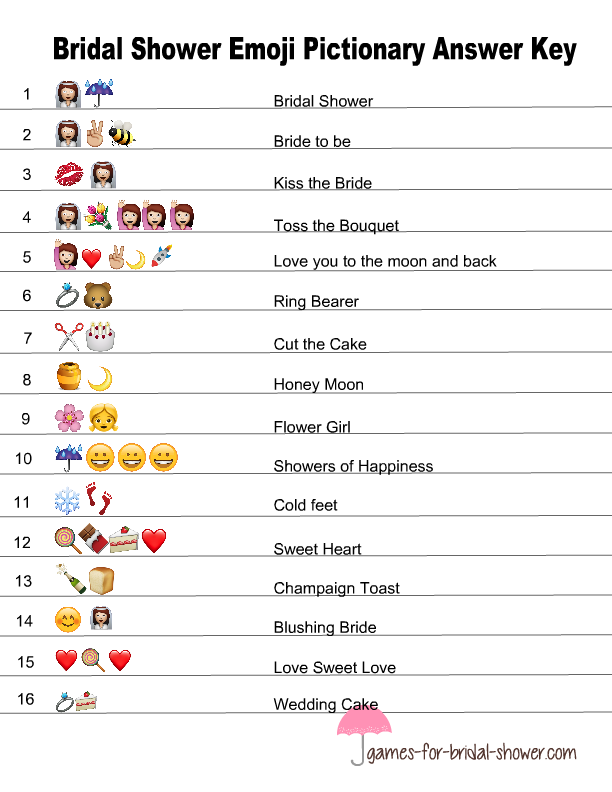 This is a free printable for this Emoji pictionary bridal shower game. This cute, modern and fun game will be loved by your party guests. Just click on this image shared above and the bigger printable game sheet image will open up. You can either print that image right away or save it to print later. This cute free printable game is decorated with image of a pink rose and white butterflies. I always make the games that I add to my websites with great love and care so all the guests will enjoy playing these. I want your bridal shower party to be filled with fun, joy and laughter. This cute game printable has a taupe header with a pink rose and white butterflies. Just click on the thumbnail that is shared above and a bigger printable image will open up that you can save. 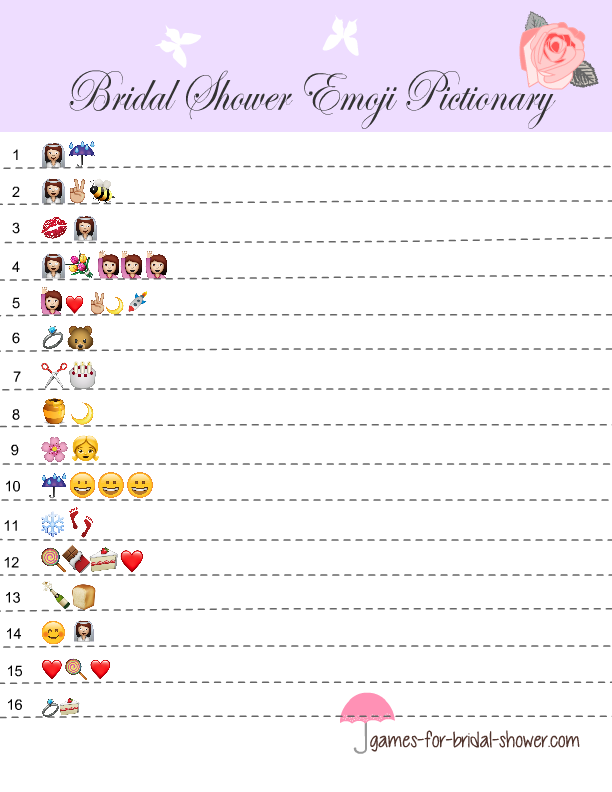 This is another very pretty color for this fun bridal shower emoji pictionary game. If lilac color matches the color of your party's theme then please go ahead and save or print this cute game card.